“First Monastery of the Ursulines in Quebec”. Ursulines’ workshop. After Joseph Légaré (1797-1855). This painting has been reproduced countless times In our community, it’s rumored that the original was a drawing from memory, by one of our sisters. It depicts the first Monastery, just a few years after its construction. Louis-Joseph Légaré painted this version. In 1817, he began to make copies of various paintings, particularly those brought over from Europe by the Desjardins brothers. The artist even noted the purpose of various parts of the building. 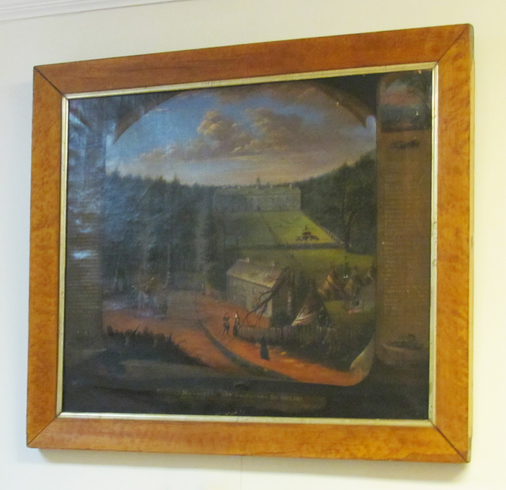 In the foreground, you can see Madame de la Peltrie’s house and a native camp, which shows the dedication of our sisters to live near the Native Americans.